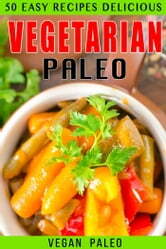 Vegan Paleo loves bold, imaginative flavors from around the world, and his magically simple combinations. He has come to rely more and more on vegetables and grains in Fresh & Fast Vegetarian,he offers 50 of his favorite receips. Most can be made in half an hour or less some are meals in themselves, while others are smaller dishes that can be paired to create a quick but sumptuous dinner. He spent most of his life learning to appreciate good food, good health and good friends surrounded by great old- fashioned cooks! The appreciation of fresh fruits and vegetables became a part of his... quite naturally.